… I felt the strangling tendrils of a cancerous horror whose roots reached into illimitable pasts and fathomless abysms of the night that broods beyond time. The Mansions of Madness foamcore plans get an update. I think several people out there have built my Mansions of Madness foam core box inserts, and they no doubt just put down an extra 5mm in height on two of the counter trays to the corrupting influence of Yog Sothoth, because I didn’t receive any complaints! Thankfully, sanity has once again re-asserted itself, and the error has been fixed. Please make an Arkham Horror plan! Thanks a lot for your plans and videos. Looking forward to your plans for Eldritch Horror (including Forbidden Lore expansion). That’s on the ‘to do’ list! Any news re Eldritch Horror plans? I definitely do not want to push you, just would like to understand if it makes sense to wait or to try create the plan myself (based on some examples published in BGG, but frankly speaking I don’t like all of them). Thanks so much for these plans. 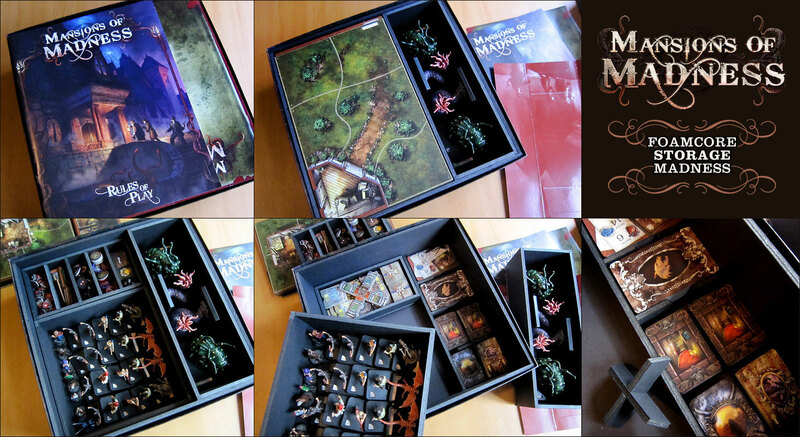 I finally took some time this afternoon to make this insert for my Mansions of Madness. Kudos to those that design and makes these for all their games, as they are pretty time consuming. At least for me, as I have a very short attention spam so I’d make an insert, take a break for a bit, make another one..hah. I’ll try and put those plans nearer to the top of the list Yury! Npe, you definitely won’t get sleeved cards into this insert. It’s a tight fit as it is. Greetings! Is there a chance we’ll see a version 2.0 plan for the recent second edition of the game? Either way, rock on and thanks for all of the plans I’ve already enjoyed working with! Perhaps, but to be honest I’m not sure whether I’m going to get the new version or not. Bottom tray, make the lower section (for normal figures) 45mm deep, and all figurres can stand up (bank tray then needs to have 28mm walls to fit). In the bank tray, I added 10x43mm rectangles to lift the front edge of the cards, means finger slots are not needed but more imprtantly means cards dont slide out if you tip the tray!